Toyota keeps moving forward as the world's top car manufacturers. What its founder, "Kiichiro Toyoda", left behind is immeasurable. He was not simply a man who brought its automated weaving machine manufacturing to automobiles. With undeveloped Japanese technology and the controlled economy of the war, Kiichiro always had "free competition" in mind. The foundations of modern management which he created with his power of conception, still form the basis of Toyota's development and production capabilities to this day. Kiichiro Toyoda was born in Shizuoka Prefecture, Fuchi District, Yoshizu Village, Yamaguchi in 1894. His father was inventor of a fabric weaving machine who was representative of Meiji Japan, Sakichi Toyoda. Seeing his father work day and night immersed in the research and development of automated weaving machines caused Kiichiro to have dreams of his future as an inventor and engineer. After he graduated the engineering department of Tokyo Imperial University in 1929, he joined the company which his father had started, Toyota Boushoku. He became a development engineer on automated weaving machines. The automated weaving machine which Kiichiro developed as a lead engineer is said to have been a masterwork which exceeded even the technology which his father had pursued, and was his first great success as an engineer. Kiichiro's decision to enter the automotive industry is said to have been largely influenced by the inclinations of his father whom he respected. His father was deeply interested in the development of domestic automobiles. Kiichiro later recalled, "I don't know how many times my father asked me if I would try making automobiles". Kiichiro had a pure dream as an engineer shared with his father. However, at the time in Japan, even though it was possible to manufacture automobiles, industrialization was extremely difficult. And so he determined his goal, namely the mass production and mass sale of passenger vehicles for the general public which the United States excelled at. In terms of technological innovation as well as cost reduction through economy of scale, in order to close the gap with American companies, he was confident that the only option was passenger vehicles with its large potential market. In 1933 he newly established an automotive department in Toyota automated weaving machines company, formally starting operations. 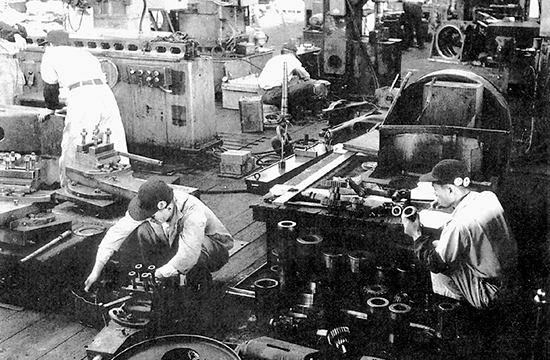 One Chevrolet was taken to the Kariya factory, where the engineers disassembled it, sketched out the parts one by one, and learned the workings of the automobile with trial and error. 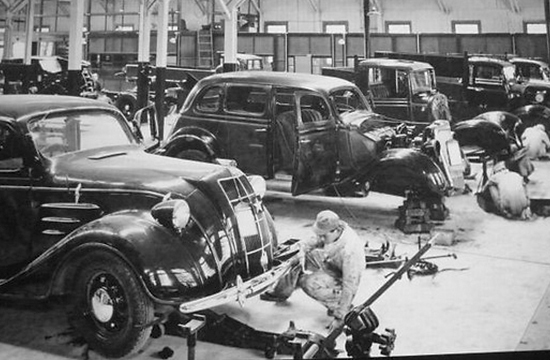 Creating the precision parts for automobiles and especially manufacturing of engines were extremely difficult, with many failed products mounting. Then finally as a result of their efforts, Toyota Motor Corporation was established, with Kiichiro appointed as vice president, and then appointed as president in 1941. It is certain that the protection of domestic automobile operations from foreign capital as well as the selection and concentration of companies were required. However, Kiichiro's ideal was not to evolve automobile manufacturing into a government-run industry. At the time, while admitting the effects of preventing dumping of foreign investment firms by this law, he stated clearly that "Relying on your own power is the only way for there to be fair competition".